Aolvo versatile camping companion is quality tempered steel construction with a rubber grip. 5 in 1 functions, including shovel, dibble pick, saw, compass and bottle opener. It is able to be folded in a compact nylon carrying pouch for lightweight transport.perfect size to place in trunk for emergencies: digging your car out of sand/mud/snow, or self defense . Ideal for camping, hiking, in your car. keep it handy at a backyard party and amuse guests using the bottle opener . - Multi-function: folding shovel, dibble pick, saw, compass and bottle opener. - Made of solid tempered steel, durable and firm. - Comfortable soft rubber grip handle. 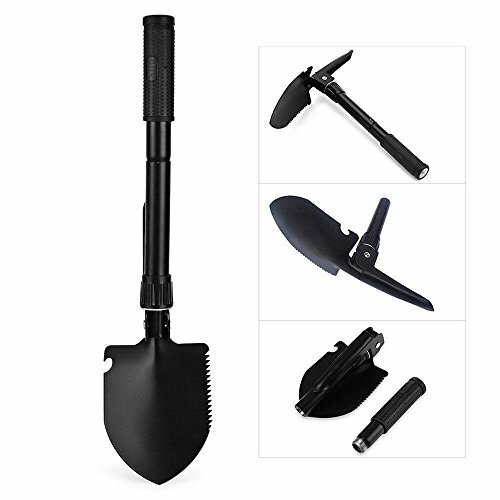 - Folding shovel for easy storage. - Compact, light weight and multi-purpose. - You can store it in your car when not in use, so it could be hand in emergencies. - Come with a nylon carrying pouch, it is more convenient to hang on your waist. - Great for outdoor activities like gardening, camping, hiking, digging and so on. [Durable Strong High Carbon Steel Shovel] - Made of high carbon steel, the shovel head is strengthened and hardened by heating and quenching several times for high strength and high elasticity, Anti rust and anti corrosion, super strong can be used for a long time. [Canvas Carry Pouch Included] - Ultra lightweight and super compact tools, a carrying pouch is presented for hanging on a belt or backpack.When folded it can easily be packed on a camping or beach trip or carried out to the garden.